”TMI” means Too Much Information for you people without teenagers in the family. 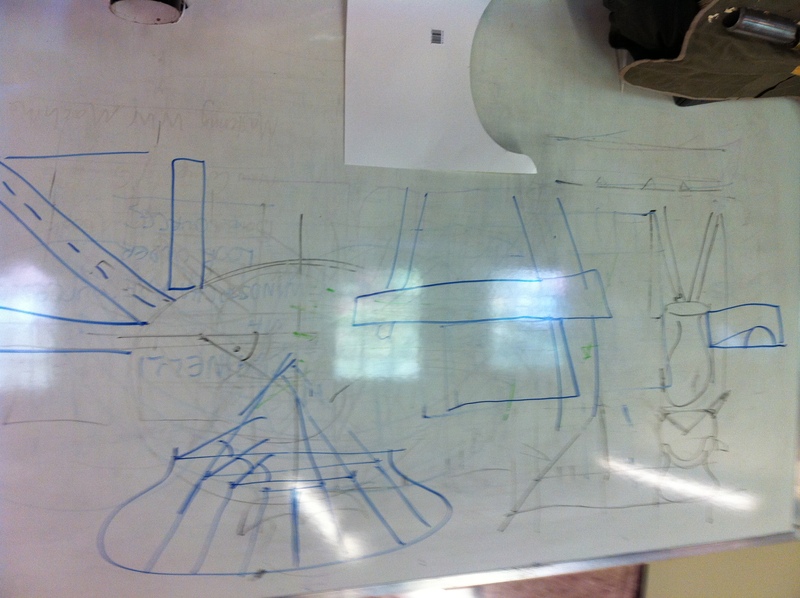 You want to see how I felt about lunchtime today — the picture below is my brain on chairs. 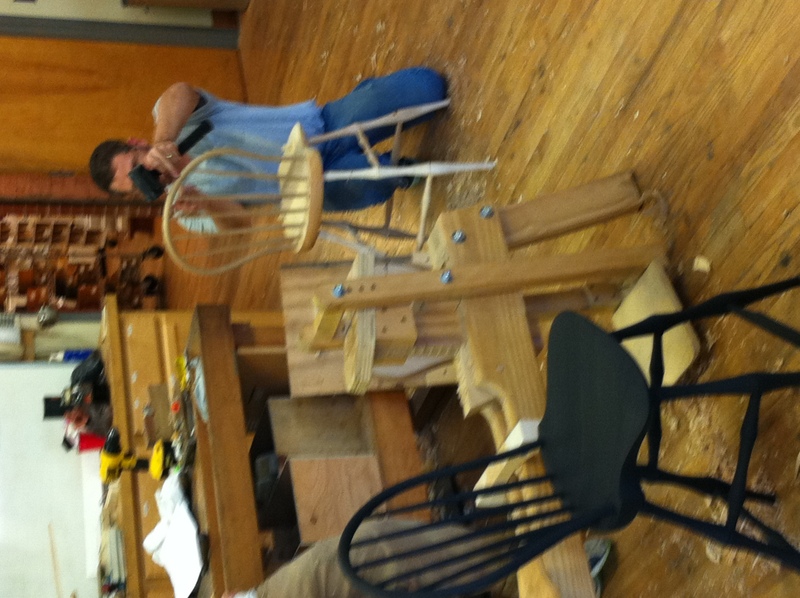 Day two of seven and we continue tomorrow with each student building their own Windsor chair, and I must admit I am a little intimidated. 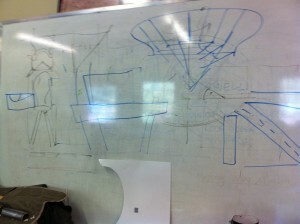 Today Peter finished putting his demonstration chair together. He started out this morning with digging out the seat and shaping it with the adze, scorp (is scorping a word? ), travisher and any other thing he needed to make it work. He shaped the outside by sketching a line around the edge with a pencil and then making some pretty darn aggressive cuts with the drawknife. It didn’t take very long to make a lovely, symmetrical seat with hand tools only and just a few lines sketched on the seat. It was marvelous to watch. I’ll let you know how mine goes later in the week. 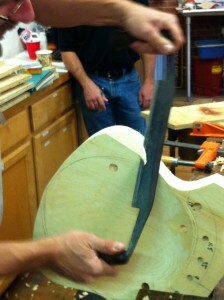 After the seat was almost finished, we watched Pete add the legs. We were only lacking the smoke because the mirrors were much in use and the way the stretchers go in, there is not much room for error. 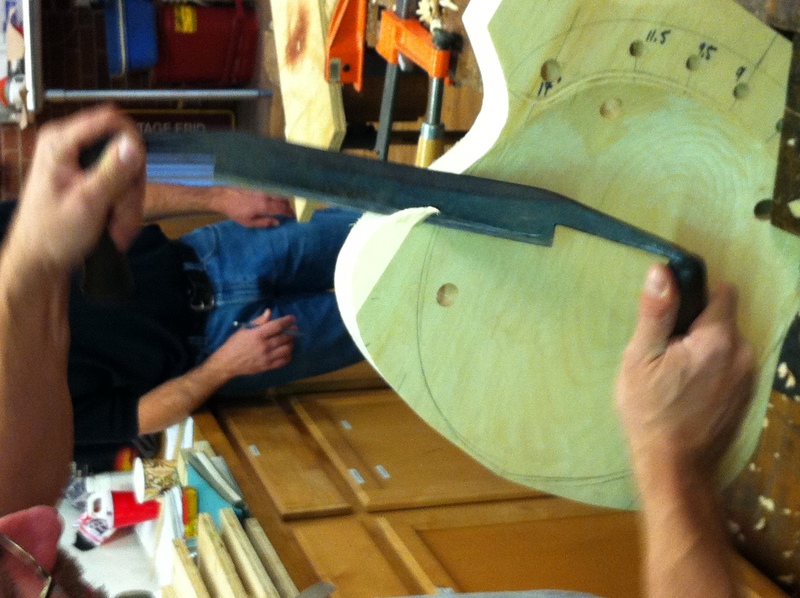 We spent a lot of time learning about making the mortises and tenons so they would fit together tightly. 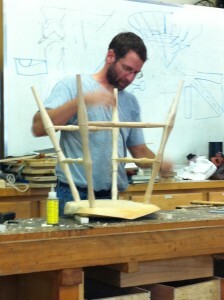 After the seat was legged up, Pete moved on to the back and the spindles. Remember we bent the bow yesterday and it was in the form overnight, so he shaved the ends gently and precisely and then mounted it in place. 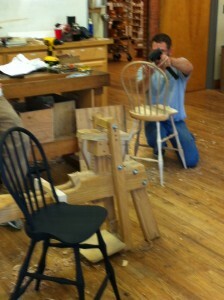 After that, he moved on to installing the spindles. With some sweet little tricks for getting the lengths correct and drilling the holes in the bow in the right direction, all it needed was wedges to hold it together for the next 200 years, and a lot of finishing. We can talk about milk paint later in the week. Go past the edge now and then so you will know where the edge is. We only sand what we don’t understand. There is a reason we call it abrasive. Wish me luck!! See you tomorrow. 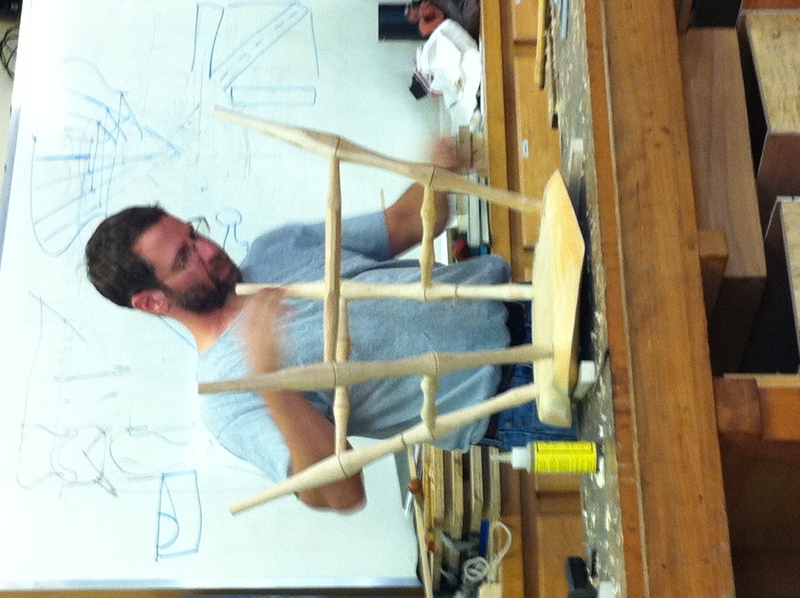 Click here to read about Day 3 of Peter Galbert’s Build a Windsor Chair class.